In medieval Madrid, Plaza de la Paja, lying a short distance to the southwest of the city centre, was the most important square in the city. It became sadly neglected through the 18th, 19th and early 20th centuries, but more recently it has gained a much needed tidying up and is now one of the nicest squares that the city has to offer. La Capilla del Obispo, which adjoins Iglesia de San Andrés, at number 9 Plaza de la Paja, is probably the most beautiful chapel in all of Madrid. It was built between 1520 and 1535 by Francisco de Vargas. His son, Gutierres Vargas, later bishop of Plasencia in Cáceres, Extremadura, also helped to build it. The chapel was originally designed to house the body of San Isidro, though his remains were finally located in the Iglesia de San Andrés, next door. It now serves as a memory of Bishop Don Gutierres Carvajal of Plasencia, a member of the powerful Vargas family of Madrid who lived in the area. The chapel has a particularly striking alabaster tomb of Carvajal, who became an Archbishop before he died, and it is he who is most associated with the chapel today. Carvajal even gave the square its name. Plaza de la Paja means, Square of the Straw, and is derived from the fact that the bishop used to auction off surplus straw in the square every day. The straw came from his farm lands near Plasencia and was used to feed the mules they kept. La Capilla del Obispo is a striking example of a church in the act of transition from Gothic to Renaissance. It is the only surviving example in architecture of the mature Isabelline Gothic style once common throughout Madrid. The Renaissance doors are another notable feature, made by Francisco Giralte, as are the inner wooden doors, which are considered the work of Francisco de Villapandó. The High Alter of the chapel employs a Plateresque style from the late Gothic period in Castile. To the right of the alter is the tomb of Francisco de Vargas who died in 1524. To the left of the alter is the tomb of his wife, Inés de Carvajal, who died before him in 1518. 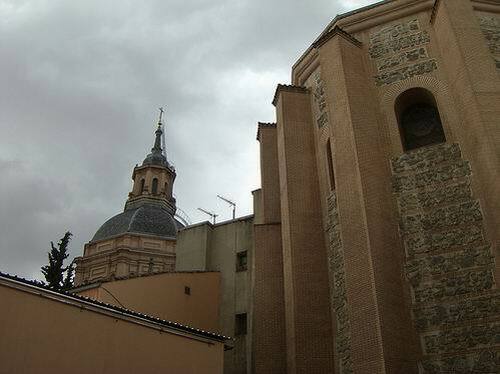 You can reach La Capilla del Obispo in the Plaza de la Paja by Metro to La Latina on line 5. There are also buses available; numbers 3, 31, 50, 60 and 65 will take you there.